Do not miss these posts! 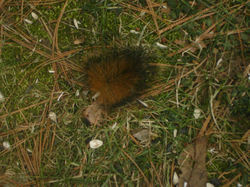 C. a very large woolly bear caterpillar? All these things ran through my head, but upon closer inspection, I realized it is the tip of our darling Red Tail's missing tail! Remember we noticed his injury the other day? Well, here's the shocking evidence of the recent attack. Thankfully we found it after we had already seen Red Tail with the injured tail. If we hadn't seen him before this (in fact we saw him at breakfast), we would certainly be fearing the worst. I mean for one, where would we "keep" it? It's not exactly something we'd glue in our nature notebook! And for two, shouldn't we wait until it is less, well, fresh, for lack of a better word? Am I right? Any thoughts on this anyone? Any taxidermists out there, lol? Are we talking probable germs, possible disease or just run of the mill yuckiness?